In summary, she had a great time! Yay! She even took a nap. She yelled and clapped at appropriate times during performances, she didn’t heckle anyone. She was very patient when a strange young child tried to smother her with germs. It was a fantastic day. As promised, here’s some cute. We expected the heat to be an issue, but it turned out to be a beautifully overcast day. 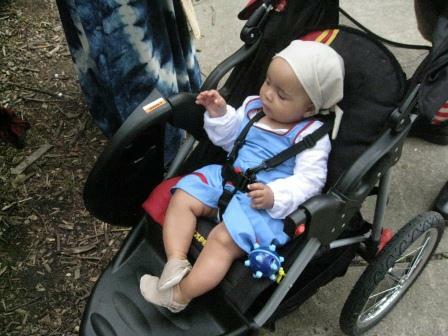 It was windy and a bit muggy, but it was perfect for testing the wee-one out and about. Our biggest concern was the number of people who called her a “handsome young sir”. 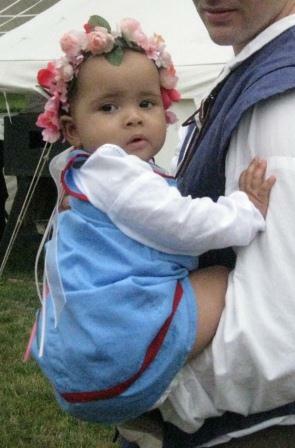 We remedied that by the end of the day, when I bought her a flowered headband. A mini dress diary will be posted today. 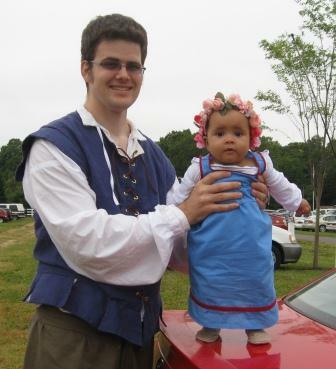 If I have enough time before the PARF, I’ll cover her stroller in faire themed fabric. 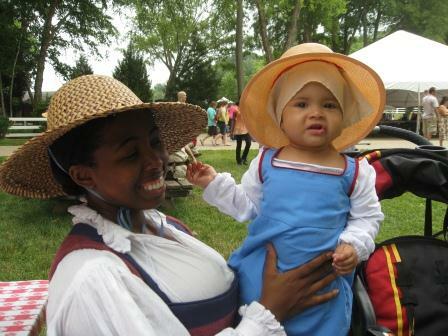 The NJRF was an ideal first faire for the baby, because of it’s size. I imagine that most of the people who would have come were scared off by the impending storms that never showed. However, they had just enough seating at the joust to handle the bodies without over-filling the “grass seats,” so it worked out. The location was beautiful, and the cast was great. We saw many of our favorites from PA, including some familiar vendors. The food was edible, and the Rita’s stand was a welcome sight. The shows that we saw were well-staged–this campsite is a treasure, and the actors voices carried well enough to understand and to enjoy. We will be adding this event to our calendar going forward. The only new item that I finished was a pair of pants for the husband. They are Simplicity 3519 with minor alterations. I didn’t have time to construct his shirt that I already cut out, but I’ll do that today just to get the pieces off my table. I also need to finish his noble shirt, which has about three steps left to completion. Tonight, I’ll clean the Tower in preparation for the mad dash to August. I have a ton of work to do. Here’s a shot of the Munchkin bonus counters that I mentioned in the last big post. Now…off to finish shirts! Thanks for reading!